I obtained this figure from Dr. Haddon, who has published a description of it (5, p. 220). He learned it in Chicago in 1901, from the old Navaho men who taught him the other Navaho figures. Hogan is the native name for a tent. First: Hold the left hand with the fingers pointing upward and the palm slightly toward you. With the right hand arrange a part of the loop upon the left hand so that it crosses the backs of both index and middle fingers, and passes to the palmar side between the middle and ring finger, and between the index and thumb; let the rest of the loop hang down on the palm (Fig. 548. In this and some of the following drawings the hanging loop is represented as quite short, to save space). 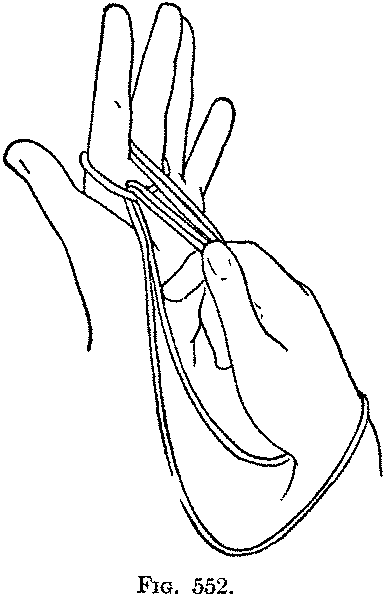 Second: Put the right index from the near side under the left near index hanging string, and then through between the index and middle finger, and with the ball of the finger pick up the cross string which is on the backs of the left index and middle finger, and pull it through between these fingers (Fig. 549), and then out to the full extent of the string (Fig. 550). 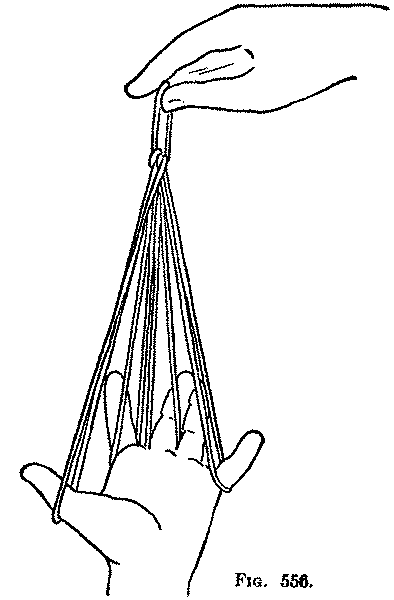 Third: Letting the loop hang down on the left palm, put the whole right hand from the near side under the near string and into the hanging loop. Then with the right thumb and index catch, above the string crossing the palmar surfaces of the index and middle finger, the two strings which come from between the left index and middle finger (Fig. 551), and draw them out to the right (Fig. 552) as far as possible. In this movement the loop which hung on the right wrist slips over the right hand and along the two strings just drawn out, until it reaches the palm. You now have on the left hand a loop on the index and a loop on the middle finger, both loops knotted together lower down on the palm (Fig. 553). Arrange the four strings which hang down on the palm below the knot so that they lie side by side evenly and uncrossed, with the two which pass up through the knot and between the index and middle finger lying in the middle between the other two. You will observe that the near string runs up to the knot, passes from the front around a cross string, comes forward, and passes to the far side as a second cross string over all four hanging strings; it then passes from behind around the back cross string, and hangs down in front as the far string of the four. 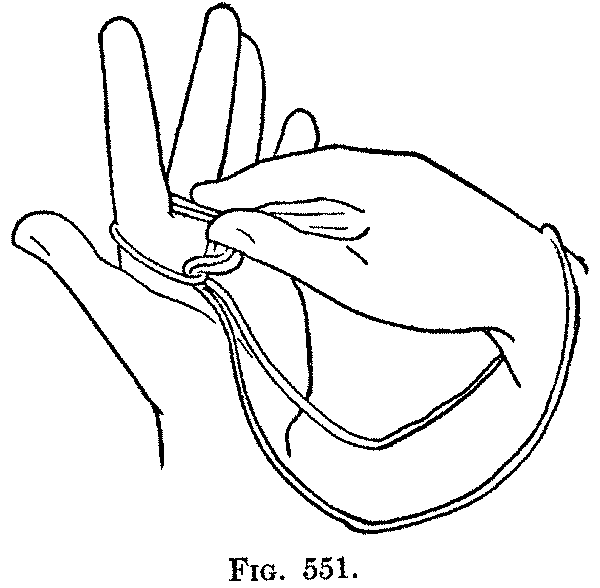 Fourth: With the thumb and index of the right hand pick up, below the knot, the near hanging string, and put it behind the left thumb; in like manner pick up the far hanging string, and put it behind the little finger (Fig. 554). 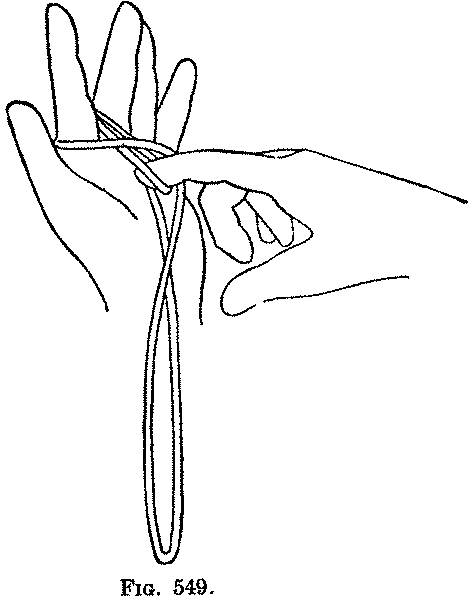 Fifth: With the right thumb and index pick up that straight string of the knot which passes in front of the four hanging strings (Fig. 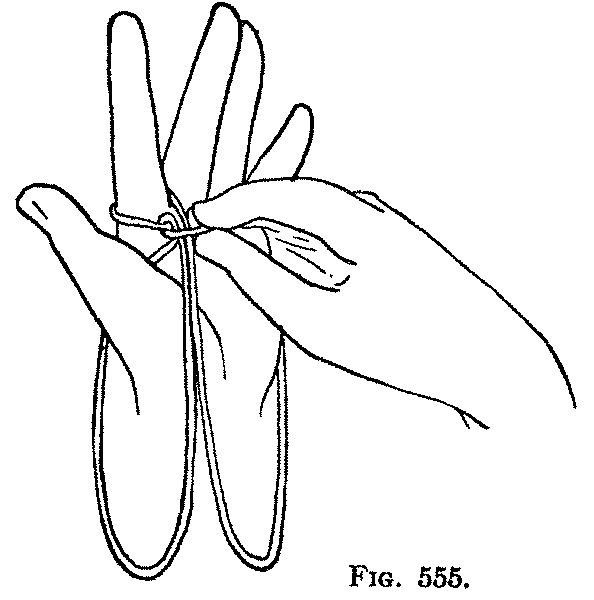 555), and pull the loop out as far as possible; then lifting the right hand sweep the left hand down, with the palm up and the fingers pointing to the right, and draw the strings moderately tight, and you get a hogan, or tent, with the two sticks coming through its peak (Fig. 556). This interesting figure belongs to the class wherein the movements consist chiefly of one hand arranging the strings on the other hand.